Who has the best chin in boxing today? Who can take a punch like no one else? 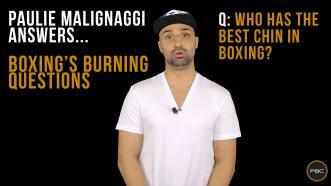 Two-time world champion and Showtime Boxing analyst Paulie Malignaggi gives the answer in the first installment of our "Paulie Malignaggi Answers Boxing's Burning Questions" series. He breaks down why former 147-lb world champion & current top contender "Showtime" Shawn Porter can slug it out toe-to-toe with the best of them. On December 10, 2016, Jesus Cuellar will defend his title live on Showtime against former champion Abner Mares in an exciting 126-pound main event bout. Former champion and esteemed boxing commentator Paul Malignaggi will be on-hand serving as the ringside analyst for the fight and he recently stopped by PBC HQ to break down the bout. Find out what it will take from each fighter to leave the ring victorious. Then, on Saturday, December 10th, be sure to tune into Showtime at 10pm ET / 7pm PT to see who wins! 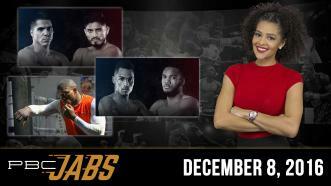 This week on PBC Jabs, Paulie Malignaggi breaks down our December 10th card, we take a look at the other talented fighters who are featured on the same card, and we get to know undefeated and fast-rising heavyweight prospect Izuagbe Ugonoh. On December 10, 2016, Jermall Charlo will defend his 154-lb title live on Showtime against tough prospect Julian Williams in a highly anticipated bout. Former champion and esteemed boxing commentator Paul Malignaggi will be on-hand serving as the ringside analyst for the fight and he recently stopped by PBC HQ to break down the bout. Find out what it will take from each fighter to leave the ring victorious. Then, on Saturday, December 10th, be sure to tune into Showtime at 10pm ET / 7pm PT to see who wins! 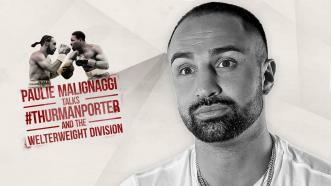 Former world champ and analyst Paulie Malignaggi breaks down Thurman vs Porter and what it means in the fight to the top of the welterweight division. 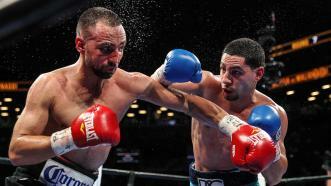 Danny Garcia wore Paulie Malignaggi down over the course of the fight and won when the referee waved an end to the bout in the ninth round. “Magic” will be in the air—or in the ring, at least—when Premier Boxing Champions returns to ESPN with a showdown between former 140- and 147-pound champ Paulie Malignaggi and reigning 140-pound kingpin Danny Garcia.